If you are going to Peru, you are visiting Machu Picchu, right? If not, what are you thinking? Add it to your list, seriously! It’s one of South America’s coolest travel sites. Oh, and while you are at it, add one more thing – Huayna Picchu. Huayna Picchu, also spelled Wayna Picchu, is that tall mountain standing in the back of nearly every Machu Picchu picture. The mountain stands over Machu Picchu and is deeply connected to the site. Translating to mean Young Peak in Quechua, Huayna Picchu was said to be the home of one of Machu Picchu’s most important priests. The top is covered in ruins and offers one of the best views of Machu Picchu. The mountain, at first site, looks more suited to rock climbers with lots of rope and equipment rather than the average backpacker. It’s definitely not a hike for the faint of heart but it looks far worse than it really is. The top of Huayna Picchu stands about 360 metres (1,180 ft) above Machu Picchu itself. The path up is STEEP and can be quite dangerous at points with slippery rocks and drop offs that would send you down a few hundred feet if you fell. Don’t go up if you are afraid of heights or not in good shape. That being said, the hike is only about 45 minutes to an hour long and if you are in half decent shape, you’ll make it to the top. The view of Machu Picchu is an incredibly motivating reward. 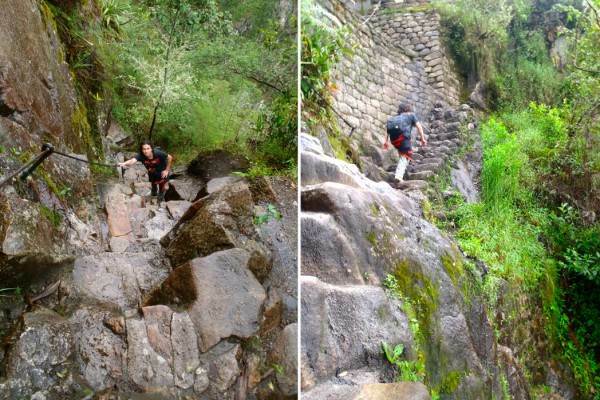 Don’t plan on just showing up and climbing Huayna Picchu. This steep, dangerous path is restricted to 400 visitors per day and closely monitored. Every visitor must check in and check out of the path so the park rangers know that everyone made it back ok. If you want to be one of the 400, you will have to plan ahead. In the past, the Huayna Picchu tickets were on a first come, first serve basis right at the entrance gate, which is located on the far side of Machu Picchu, near the Sacred Rock. 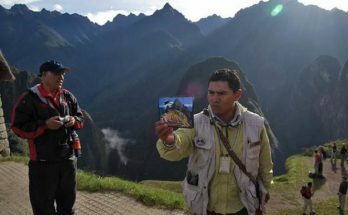 Now, you must buy your ticket beforehand when you purchase your main Machu Picchu entrance ticket. 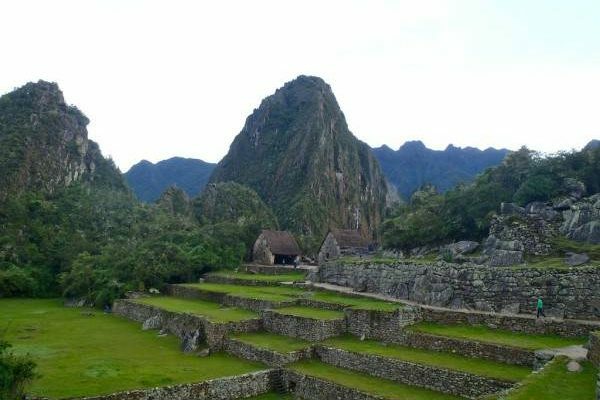 In the high season, tickets sell out quickly, so you should plan on buying your Machu Picchu ticket as soon as your get to Cusco. 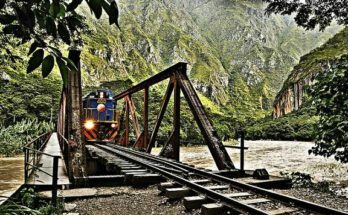 You can wait and buy the ticket in Aguas Calientes in low season but it’s not a smart move during peak travel times. 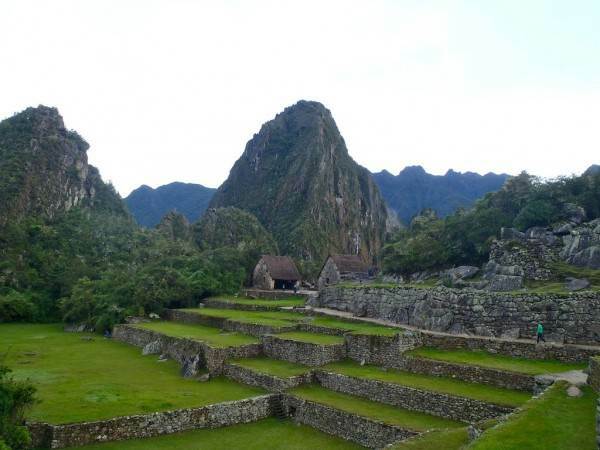 The ticket costs a bit more if you want to climb Huayna Picchu and visit Machu Picchu. The 400 visitors are split into two groups – 200 at 7am and 200 at 10am. Everyone lines up a few minutes before their scheduled time and they slowly let you check in by signing your name to their record’s book and head out. They get everyone through within about an hour. Two hundred people climbing those tiny stairs can be scary but the trail actually doesn’t seem too crowded. People tend to climb at different speeds which spreads everyone out. Should You Go at 7am or 10am? At 7am, it is cooler and you won’t be climbing with the sun on your back. At the top though, it can often be cloudy until 9-10am so you might have to wait around for the clouds to clear for awhile. We opted for the 7am and were really happy with it, even though we did have to wait around. It was incredibly peaceful at the top of Huayna Picchu and it was amazing watching the clouds swirl in and around the mountains. The 7am group also has more time to do the rest of the Huayna Picchu hike, which you can choose to do and which takes you another hour or so further along. 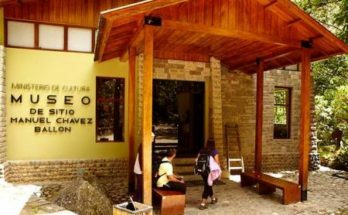 If you opt to leave with the 10am group, you will have a few hours to tour Machu Picchu before hand. This is nice because you can learn more about the site and probably will understand more of what you see of the ruins at the top. You also usually won’t have to wait at all for the clouds to clear and will have a nice view of Machu Picchu the whole climb up. The only real downside to the 10am group is that you will be sharing the very tight path up with a lot of the 7am group coming back down. The Huayna Picchu hike is actually a large circle but a fair number of people opt to turn around after summiting Huayna Picchu rather than continuing on for the second half of the hike. If you are up to it, do the full Huayna Picchu hike which after Huayna Picchu passed by the rarely seen Temple of the Moon and the Great Cavern. If you don’t like crowds, you will love this experience as only about 100-200 people per day make it this far. Be smart and don’t goof off on the trail. The hike is very dangerous with steep cliffs all along the way. People do fall and get hurt or worse every year. Be careful. You actually aren’t suppose to take plastic water bottles or food on the trail. The guards are pretty lenient about it though. Just be sure anything and everything you take in with you, you bring back out. Don’t ruin the natural beauty of this sacred spot with your trash.